AP Social Welfare GURUKULAM Admissions 2018, TS Social Welfare Residential Admissions2018,APSWREIS 6th,7th,8th,9th classes Admissions 2018 / AP social welfare admissions , APSWREIS Social Welfare GURUKULAM Admission Test 2018: Government of AP, Social Welfare Department has given a notification for admission into Classes VI to IX in TSWEI Residential Schools for the Academic Year 2018-2019. Andhra Pradesh Social Welfare Residential Educational Institutions Society (APSWREIS) invites online applications from the eligible students for admission into 6th to 9th classes in Telangana SWR Schools for the Academic Year 2018-2019. So, online applications are invited to fill up vacancies in APSWR Schools and backlog vacancies in existing APWR Institutions. 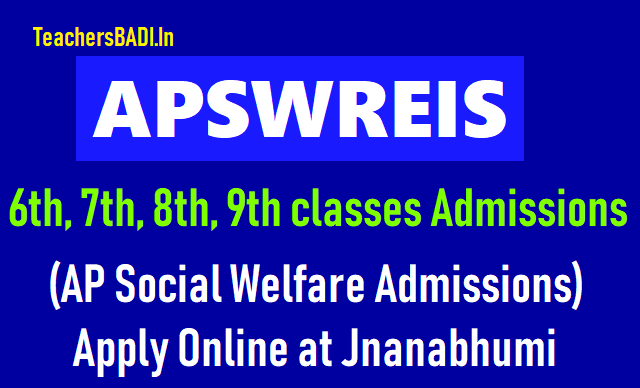 Online Application for Admission into 6th to 9th Class(Backlog vacancies)in APSWREIS. APswreis 6th,7th,8th,9th classes Admissions 2018: Notification for AP Social Welfare admissions into 6th,7th,8th,9th classes with english medium of instructions and back log vacancies in APSWR institutions for classes vi to ix for the academic year 2018-2019. To provide special coaching to the meritorious Scheduled Caste students for the academic year 2018-2019, the applications are invited from Boys and Girls for Admission into 6th to 9th classes in TSWR Institutions functioning under the control of APSWREI Society. The applications will be received through online mode only. ఆంధ్రప్రదేశ్‌ సాంఘిక సంక్షేమ గురుకుల విద్యాలయాల్లో 2018-19 విద్యా సంవత్సరానికి 6, 7, 8, 9 తరగతుల్లో మిగిలిపోయిన సీట్ల కోసం అర్హులైన అభ్యర్థులు జూన్‌ 20వ తేదీలోగా ఆన్‌లైన్‌లో దరఖాస్తు చేసుకోవాలని గురుకుల పాఠశాల ప్రిన్సిపల్‌ తెలిపారు. జ్ఞానభూమి.ఏపీ. గవ్‌.ఇన్‌ వెబ్‌సైట్‌ ద్వారా దరఖాస్తు చేసుకోవాలని తెలిపారు. ఎంపికైన విద్యార్థులకు సమాచారం అందజేస్తారని, ఎంపిక పత్రాన్ని వెబ్‌సైట్‌ ద్వారా డౌన్‌లోడు చేసుకొని అవసరమైన విద్యార్హత పత్రాలతో తమకు కేటాయించిన గురుకులాల్లో ప్రవేశం పొందవచ్చన్నారు. The selection purely on merit basis. Submission of Applications: All the students who are seeking admission into VIII and IX classes for the year 2018-2019 into AP SC Gurukulams and the students who are seeking admissions into VI to IX class in other APSWR Schools of backlog vacancies should apply through online mode. 1. Candidates can submit application through online by visiting website http://apswreis.info/ or visiting any Meeseva Kendra. There is no registration fee for submission of application through online. 1. The Girls and Boys from all Districts in AP can apply for admission for classes VIII and IX. 3. In other APSWR Schools the Boys will be provided admission in boys schools and girls in girls schools. 5. The selection of candidates will be purely on merit only. 8. The candidates should attend the counseling on the scheduled dates and centres. 9. The selected students will be allotted to the districts from which they have completed their previous classes. 10. In case of any issues related to the interpretation of admission guidelines, the decision of the Secretary will be final before and after the admission process. APSwreis 6th,7th,8th, 9th classes Admissions 2018, TS Social welfare gurukulam 6th,7th,8th, 9th classes admission test 2018, APSwreis residential Admissions, Social welfare gurukulam admissions notification 2018, Eligibility criteria, Age limit, Income limit, list of documents, online application form, Results.